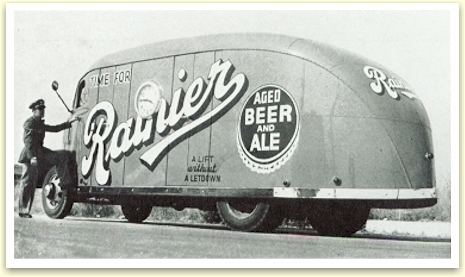 The History of Rainier - Part 1 briefly covers the period from the brand's inception to the end of Prohibition, and includes the brands introduction into Canada in the 1920s. 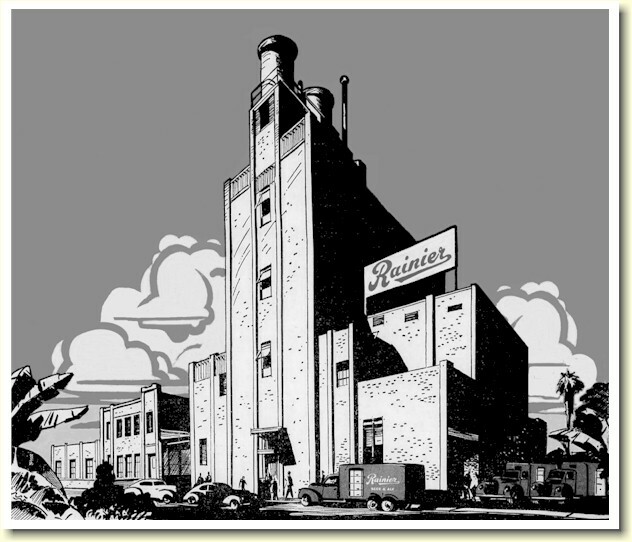 Rainier Brewing Company of San Francisco (1933-1953). Rainier brand in Seattle (1935-1999). prohibition gave brewers until 1 January 1916 to liquidate their inventories and cease operations. The Seattle Brewing & Malting Co. chose to build a new plant in California believing that national prohibition would not happen. Before the year was out the Rainier Brewing Company of San Francisco was on-line with Louis Hemrich overseeing the operation. Of course, Prohibition was voted in, but the plant continued to operate by producing soft drinks and near-beer. By 1932 people had had enough and elected Franklin Roosevelt, in part for his promise to end Prohibition. With the Repeal in sight, Rainier geared up. 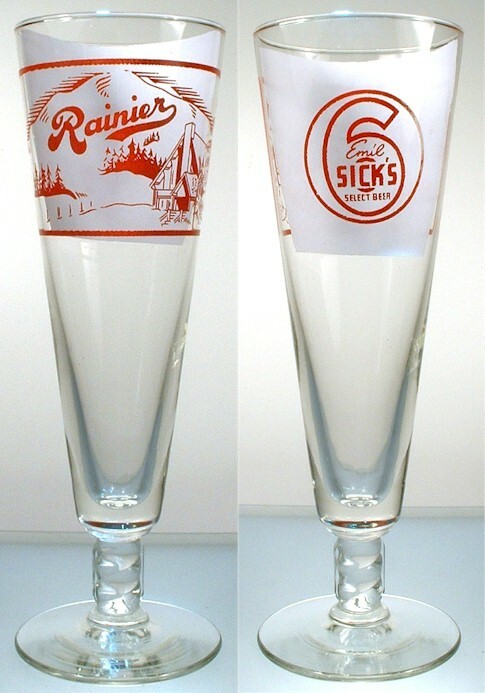 The Rainier Brewing Company, Inc. In 1932 the plant underwent extensive improvements and additions in preparations for Repeal, and by early 1933 the brewery's capacity was 350,000 barrels per year. 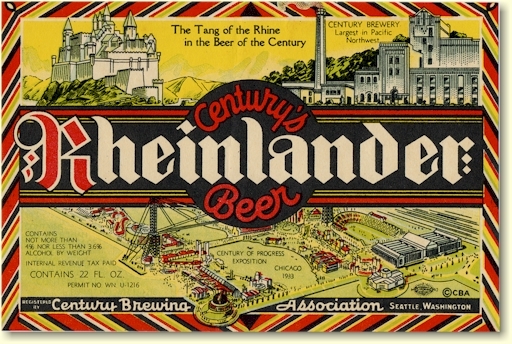 The company was still under the leadership of Louis Hemrich who, with partner Joseph Goldie, had purchased a 92% of the stock in the Rainier Brewing Co. (WA) from Seattle Brewing & Malting (SB&M) in 1925. In Sept. of that year the partners merged Seattle Brewing & Malting Co. with the Rainier Brewing Co. in forming Pacific Products, Inc. In July of the following year (1926), Pacific Products purchased all of the properties held by SB&M for $1,000,000. 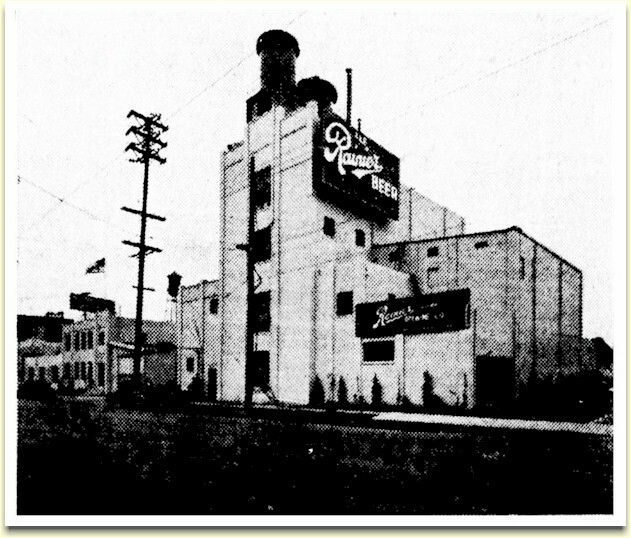 In 1927, Pacific Products also purchased the Tacoma Brewing Co. from its Tacoma, WA owners, the Pacific Brewing & Malting (PB&M). Like Rainier, PB&M had moved to SF when Washington's state-wide Prohibition shut them down in January 1916. 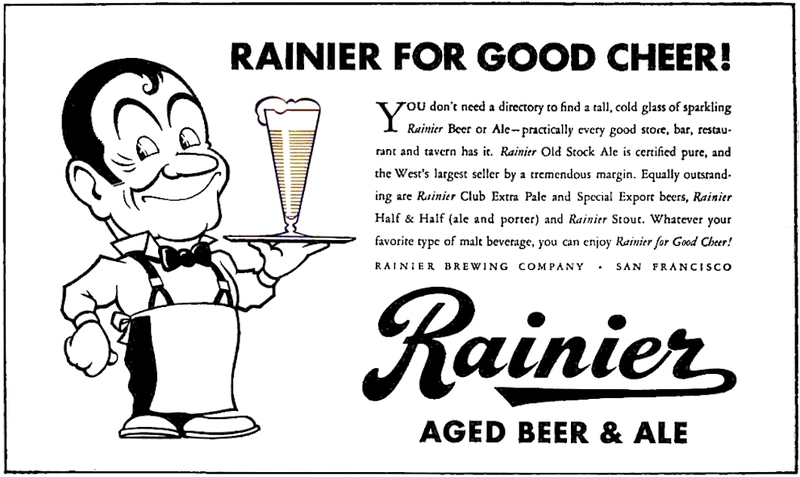 From the 1927 purchase of PB&M's SF holdings, Rainier owned the Tacoma Brewery on Treat Ave. 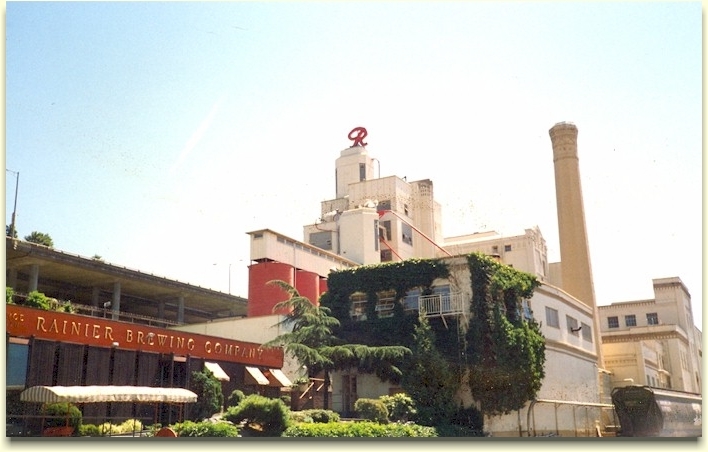 In July of 1933, three months after Repeal, Rainier sold the brewery to Regal Products, which established the Regal-Amber Brewing Company of San Francisco. 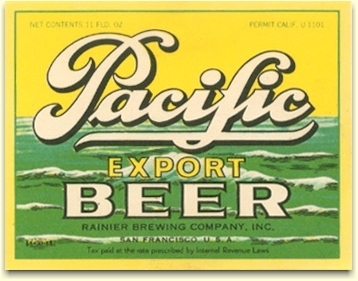 In Nov. 1932, Pacific Products reorganized as Rainier Brewing Co., Inc. - a California company. Since they had maintained production of near-beer during Prohibition, they were prepared to offer 3.2% beer immediately upon Repeal. 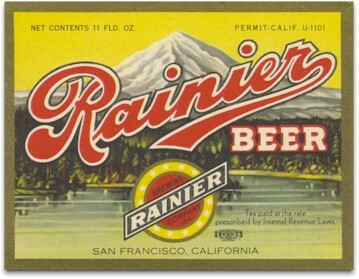 On April 7, 1933, Rainier was again selling real beer under Calif. U-Permit 1101. 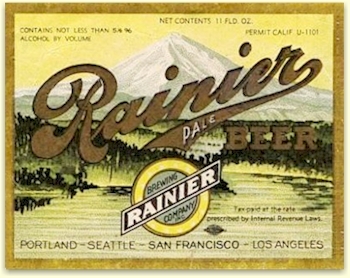 To celebrate the return of its flagship brand, the company reprised its pre-prohibition Rainier Beer label (below left). 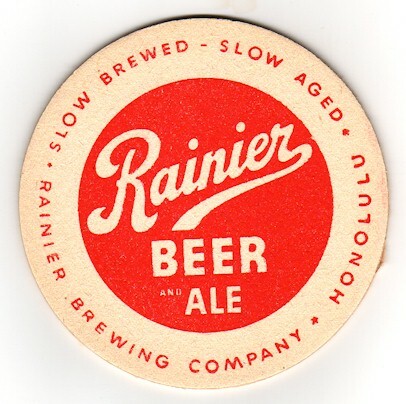 The same label was also used for the Seattle market, but rather than "Rainier Brewing Company, Inc." it reads: "Rainier Distributing Company, Seattle Washington." This beer was shipped to the old Georgetown plant, which now served as the brewery's Washington & Alaska distribution center. 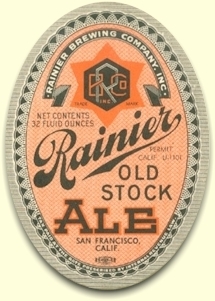 They also resurrected the pre-prohibition Rainier Pale label (below lower left) but the graphics were soon updated. In Sep. '33, they introduced Rainier Dark - a Culmbacher-type dark beer (below right). The ad (above) introduces these two early products. When beer was legalized on April 7, 1933, this was actually not the end of Prohibition. On that date the Cullen Act went into effect, allowing the sale of 3.2% beer. It was not until Jan.1, 1934 that repeal of the Eighteenth Amendment was ratified. It then became legal to produce and sell pre-prohibition "full strength" beer. Joseph Goldie, Rainier's chairman of the board, stated that "....the brewery had enough 5½% beer in aging tanks to release thousands of cases of their Pale Beer in anticipation of Repeal." He described this pre-prohibition style as a pilsner-type beer that originated in old Austria, and was made with low-kiln-dried malt and Bohemian, Saazer hops. 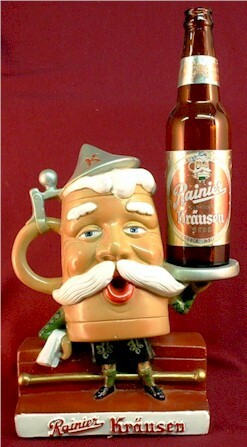 The Rainier Pale Beer label, shown above (left) gives the actual strength - a practice that is no longer allowed. This label soon changed to a more colorful version, similar to the label shown at right. 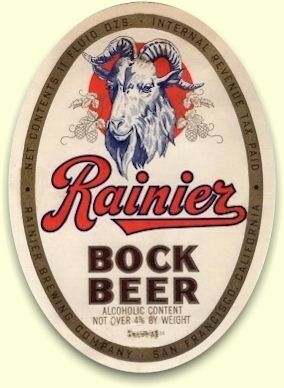 Each spring it's traditional for breweries to offer a Bock beer, and Rainier was the first to release its own version. 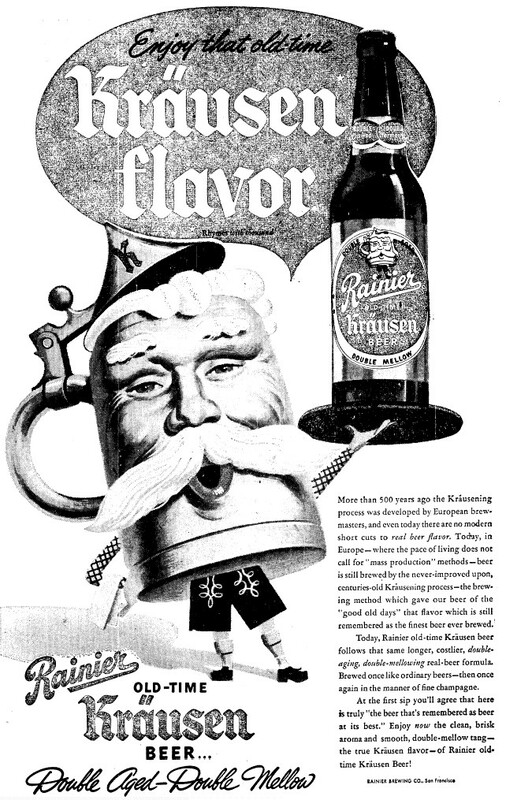 The January 1934 ad for Rainier Bock is shown here (left), and the first Bock label used by Rainier is shown above. 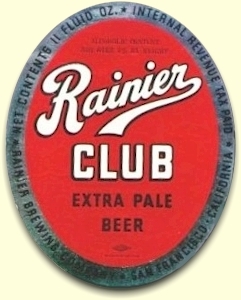 To immediately utilize the brewery's huge production capabilities, Rainier produced two brands that they acquired with the 1927 purchase of the Tacoma Brewery, Tacoma Pale Beer, and Pacific Export Beer. 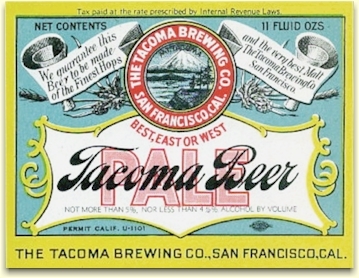 They were marketed under the names Tacoma Brewing Co., and Pacific Products, respectedly, until 1935 when they dropped this practice in favor of Raining Brewing Co., Inc. They continued with the Tacoma and Pacific brands into the late '30s. In April of '35, Rainier introduced it's "Special Export - a natural malt beer" (below left) with the slogan: "A lift without a letdown." Special Export remained a primary brand into the '50s. A couple of other products were early brands, one named after the president, and chairman of the Board, Louis Hemrich (below right). 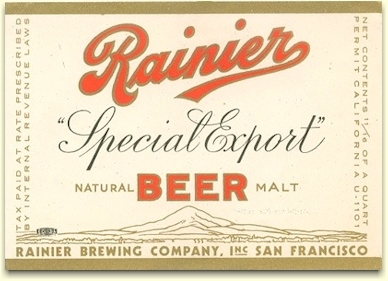 Rainier Special Export Beer label, 22 oz. 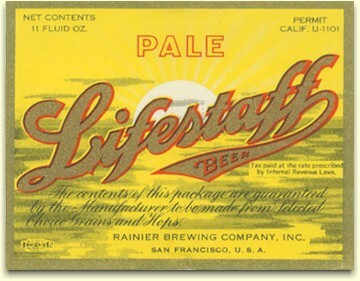 Two other budget brands were early products, Piedmont Pale Lager Beer (above left), and Pale Lifestaff Beer (above right). Lifestaff was a brand used by Louis and brother, Alvin's Hemrich Staff Products Co. during Prohibition. 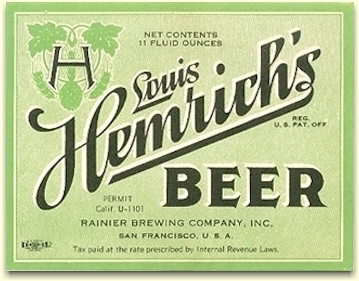 Alvin chose Hemrich's Select as the flagship brand of his Hemrich Brewing Co. and dropped Lifestaff but received a partial royalty for its use by the SF brewery. To further utilize the plant's capacity, the company contracted with wholesalers and grocers to produce private label brands. These beers included Full Value, Gold Medal, Ace Hi, Tornberg's Old German Lager, Old Vienna, Old Mission Steam Beer, Brown Derby, Leideg's De Luxe, Lisco Lager, Piedmont Pale, Schwartz & Weiss, Krug, BB Special Export, Shorty Roberts' Tally Ho, and Pilsen Brau. In June of '34, the company introduced its English Type, Old Stock Ale (left). It was advertised as Rainier Beer's "Big Brother" containing 6% alcohol. About this time they adopted the tag line: "In the West it's Rainier Beer" (or Ale). In May of 1936, Special Export was available both in bottle, and in the new Low-profile, cone top cans (see ad at right). It was soon followed by Old Stock Ale - also in the Continental Can Company's "Cap-Sealed" beer can. 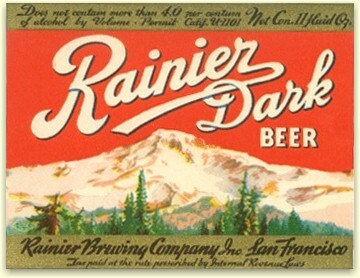 By May of '36, both Rainier Pale and Rainier Dark had been dropped from the line-up. With the introduction of the Stubby bottle in Dec. of 1935, brewers were quick to adopt this more versitile package. 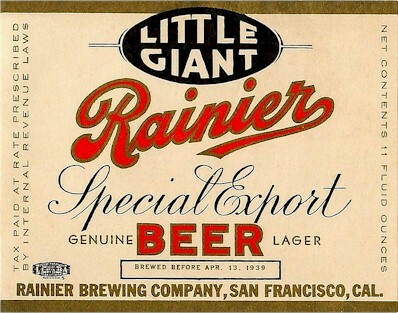 In Aug. of '37, Rainier traded the long neck for the Stubby, reintroducing their Special Export in the package they called a "Little Giant." They dropped this Special Export brand in mid-1942. 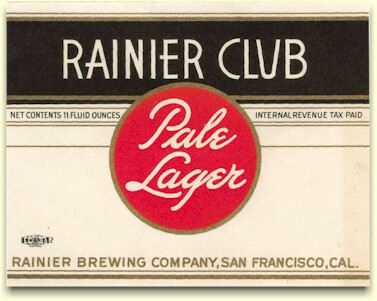 In Sept. of '37, the company test marketed a new brand in the San Francisco Bay Area called Rainier Club (below). 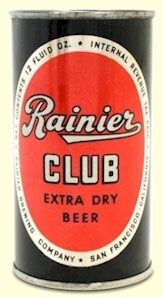 The brand was well received, and in the summer of '38, Rainier Club was launched with a new label (further below) - which would remain a flagship brand until Feb. of '49. December 1, 1937, the company did a reorganization raising their capital from $1.5M to $2.5M and dropping "Inc." from their masthead. 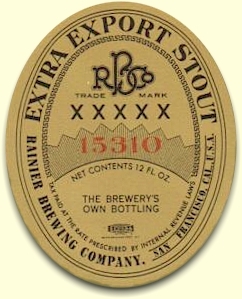 The company's discontinued Rainier Dark was replaced by their, Extra Export Stout (below left). This was originally a low alcohol product that was introduced in March of 1918, but were forced to discontinue due to WWI war time restrictions, effective Dec. 1, 1919. The 1938 label is identical to the 1918 version with the exception of the "½ of 1% alcohol" statement on the original. "Rainier Half and Half is the result of eighteen months of experiments on the part of Rainier's scientific staff to develop a half and half blend which would exactly meet the western taste." 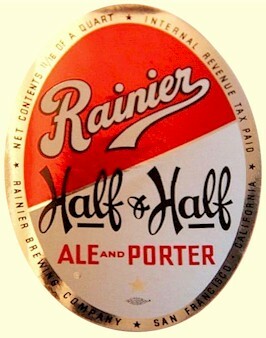 Perhaps they didn't get it exactly right, since Rainier Half & Half was gone by August of 1942. 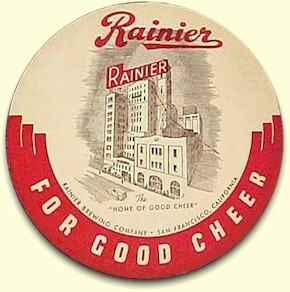 In Oct. '39, the slogan "Rainier - For Good Cheer" was introduced, and continued in use until early '46. 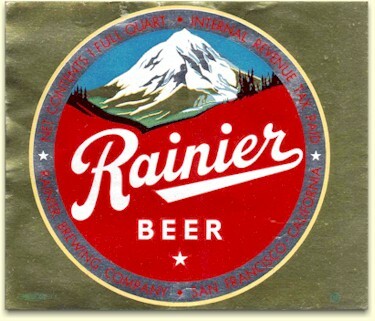 In Sept. of 1940, the company made another major change when they streamlined the iconic Rainier logo. Compare the logo in the 1941 Bock label (below) with the Half & Half label above (right). You'll notice that "Rainier" is now horizontal, the font is thinner, and the curve has been removed from the tail. 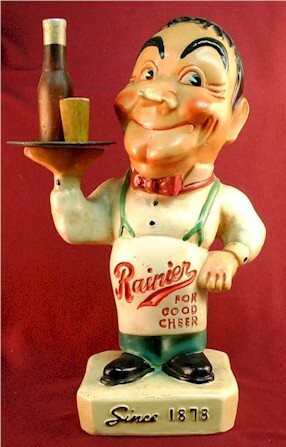 The waiter character in the early 1941 ad was a popular figure and Rainier had him made into a back-bar, point-of-sale, chalk figurine. He came in 8" and 13½" sizes. See Breweriana (below). 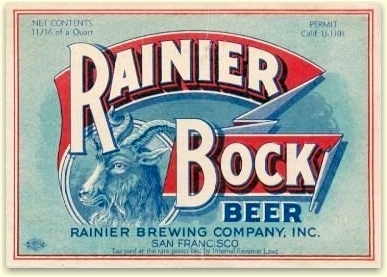 Rainier was still brewing Bock beer every Spring and this label (right), ca.1941, displays the modified Rainier logo. "Rainier Brewing Company of San Francisco, one of the oldest and largest brewing organizations on the Pacific coast, has purchased the entire plant of the Vernon Brewing Company of Los Angeles, it was announced yesterday. Acquisition of the Vernon plant is the initial move by Rainier in its plans to increase distribution in Southern California, Joseph Goldie, president, states. The Vernon brewery is less than 10 years old and is equipped with the most modern brewery equipment obtainable. The plant occupies approximately an acre of ground and in addition Rainier has acquired an acre of vacant land adjoining, which it plans to use in enlarging the capacity of the brewery as soon as materials and equipment become available. Rainier has already begun brewing in the Vernon plant, but no deliveries of beer will be made from the new plant for some time." The statement of "...enlarging of the capacity of the brewery as soon as materials and equipment become available" refers to the war time shortages of essential materials. However, by the time materials and equipment did become available, Rainier was struggling and no expansion of the plant occurred. This artist's rendition makes the new brewery look rather grand, but the newspaper photo (below) shows that it was a fairly small plant. Does anyone have a good copy of this newspaper photo? 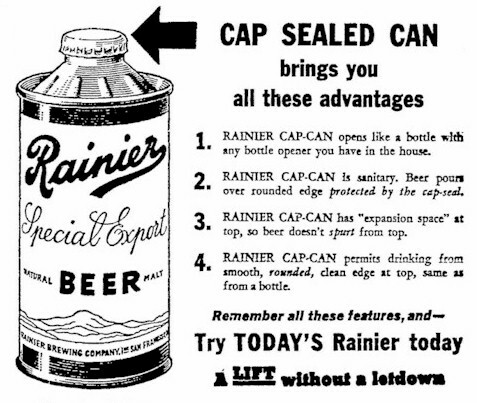 The post war era was not as good for Rainier as for some of their competitors, and they began losing market share. In early 1947 they brought on a new brewmaster, Nicholas Vacano. That May he re-formulated their mainstay, Rainier Club Extra Pale Beer and called it Extra Dry. He claimed that they "Fermented out the solids" which was marketing speak for - "here's a beer made by replacing expensive malt with cheaper adjuncts." The canned Rainier Club Extra Dry Beer is show here (at left). Apparently the public was not impressed with "Dry" beer, and by late '48 the product was dropped and Extra Pale was back. Also axed was the company's brewmaster! But Rainier Club Extra Pale didn't last long either. 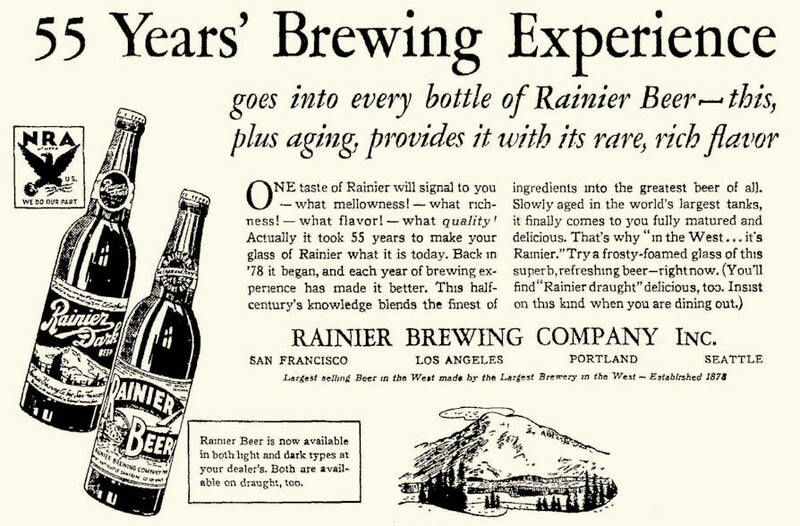 In February of '49 the new brewmaster introduced Rainier Beer - with a more colorful label that also featured a prominent image of Mt. 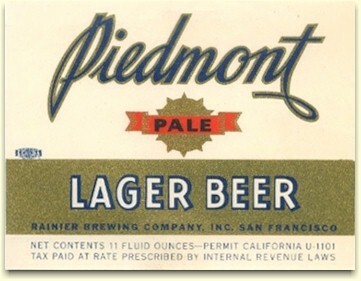 Rainier, and a return to the angled logo, shown on can (right) and labels (below). 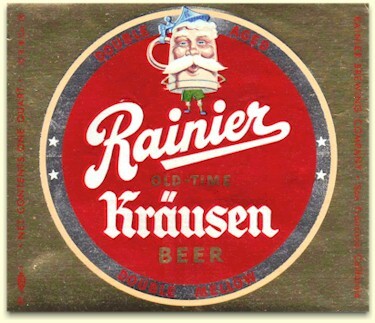 In May of '51 another product appeared - Rainier Old Time Kuäusen Beer - shown in the ad (right) and label (above), but it was too little, too late. The introduction of new brands and more colorful packaging did nothing to slow the loss of market share to Lucky Lager , as well as to the penetration of eastern brewers. That, combined with some questionable business practices, led to the demise of the Rainier Brewing Company of San Francisco. 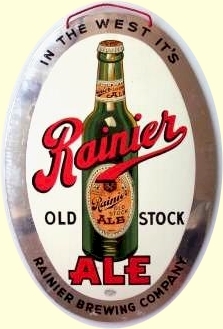 On July 22, 1953, the Rainier Brewing Co. was purchased by Emil G. Sick, who then sold the San Francisco plant to the Theo. Hamm Brewing Co. of MN, retaining sole rights to the Rainier brand. In a matter of one month Rainier Beer was again available in California, but it was now brewed in its birthplace of Seattle. 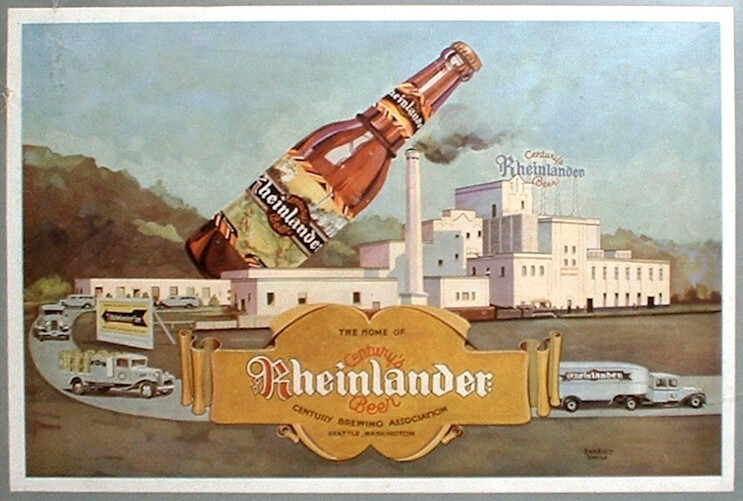 The Los Angeles plant was also sold but was never again used as a brewery. Emil Sick was responsible for returning the venerable brand back to the place of its birth, but it was a struggle that lasted 20 years and cost him over a million dollars. With the end of Prohibition this Canadian brewer sought opportunities in the U.S. market. He began with the 1933 acquisition of three breweries in Montana. First he formed a partnership with the owners of the Montana Brewing Co. and the American Brewing & Malting Co., two Great Falls firms dating from the 1890s. They turned the Montana Brg. plant into a malt house, and the American plant into the primary - thus forming Great Falls Breweries, Inc. They remained a part of the Sick empire until September of 1949 when Sick returned control to the Jensen and Johnson partners. Next he partnered with the owners of the old Garden City Brewery in Missoula. The new company was established as the Missoula Brewing Co. 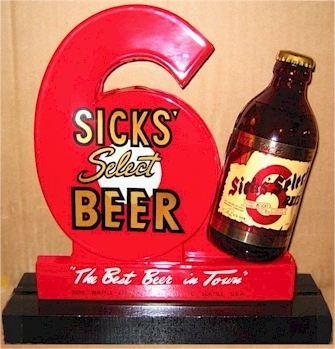 The brewery remained a Sick satellite for 16 years. Then, at the same time he relinquished his interest in his Great Falls holdings, he sold his shares back to the Steinbrenner family. The Missoula Brg. Co. was then more commonly referred to as the Highland Brewing Co.
Sick then joined forces with an old friend, Harry Goetz, and re-opened the old Henco Brewery in Spokane. 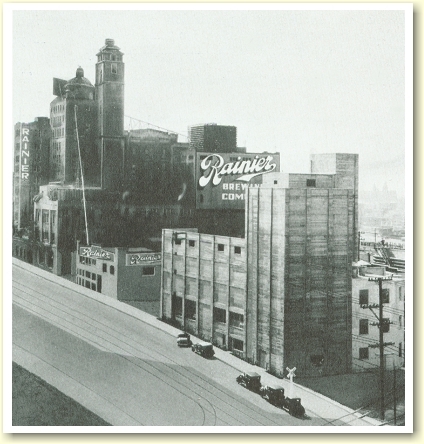 Demand soon exceeded the plants capacity and in December of 1936 they bought the old Galland-Burke Brewery, establishing Spokane Breweries, Inc. 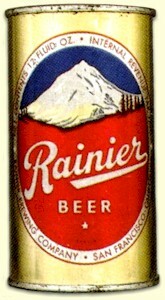 While Rainier was never brewed in Montana, it was produced in Spokane until Sick closed the plant in 1962. On May 1st of 1935, Emil Sick and Louis Hemrich of San Francisco agreed to a $2M merger agreement and formed Seattle Brewing & Malting. 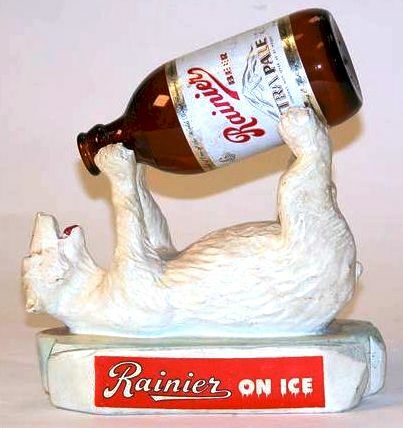 This allowed Sick to brew and market Rainier Beer in Washington and Alaska under a royalty arrangement. used from Nov. 1941 to Dec. 1943.
so there may not be many changes to this page. But for those of you nostalgic for the classic Rainier commercial of the motorcycle.. 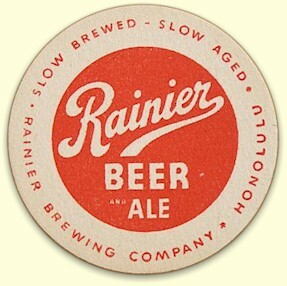 Thanks to Jeff Henry for the 1949 & 1951 Rainier labels. and can not be used without permission from Brewery Gems. Copyright © 2010 ~ All Rights Reserved.